Great guest bed, camping bed or as a waterbed mattress replacement product! The inner support system is achieved by a unique electronic welding technique that connects welds running the length of the air bed. 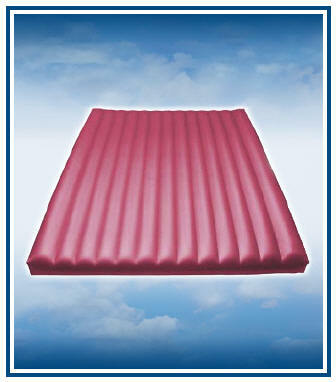 This uni-body type of construction helps minimize lateral sway, dipping, sagging and the "see-saw" effect common in other air mattresses. It also helps maintain a uniform "pull" between the top and bottom surfaces resulting in a flatter sleeping surface for better posture. Crafted for quality with heavy gauge vinyl that is durable and easy to maintain. Quality tested 20 gauge vinyl beams and bottom. Quick free flow deflation plug. Hand held, portable design for convenience. 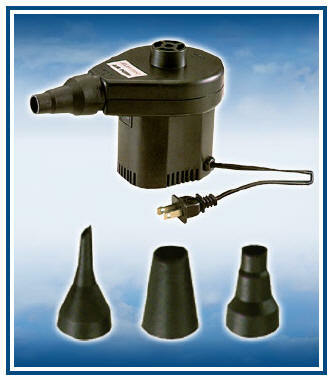 Includes three piece adaptors to fit all large volume inflatables. Multiple adaptors for different uses. For use with Sanctuary Air Beds and other small inflatables. High volume low pressure inflation. Pump pressure: 52 PSI/Pump volume: 3047 feet/minute. Consumer friendly, no tools set-up.